Preheat the oven to 450 and line a pan with aluminum foil. Coat the salmon pieces with olive oil and sprinkle with Italian seasoning. Spread goat cheese over the tops and mash walnut pieces into the cheese. 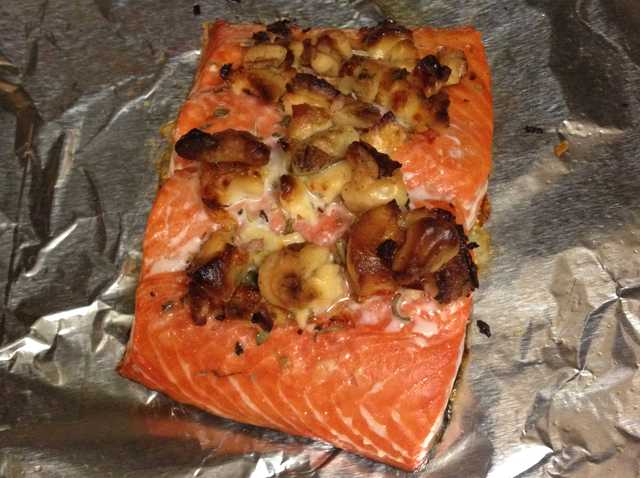 Place the salmon on the foil skin side down and bake for about 10 minutes (maybe a little less depending on your oven, mine was slightly overcooked). I was super pumped about how it turned out. I paired it with sauteed mushrooms and onions and paleo egg salad (which is really easy--let me know if you'd like the recipe).